Bucket lists are the epitome of YOLO lifestyles. People put on it everything they want to do before they die–no matter how crazy. They’re usually all the things we fantasize about doing but can’t because of, y’know, normal life. Most people will not complete their list–if they even start–during their lifetime. I have one and know that ¾ the activities on there will not be done, even if I started now in my 20s. A bit disheartening, but fun to think about and compile, nonetheless. You never know. It may happen if you really want it to. Yeah…no. Between family, work, money, time, health, and many other factors, it’s not gonna happen. Now, that isn’t necessarily bad; just means that my priorities are elsewhere. Rather than attending school 24/7 to get all the degrees I want, I rather invest my money and time into vacations with my family, or to teaching my students how to be better people. That’s all. However, as a reader and writer, there is a way for me to live out some fabulous fantasies. Picture this: a literary bucket list, fashioned after typical ones, but that we actually live out through stories we write. You can never be disappointed, it’s good writing practice, and it’s fun. You never know, if it’s more realistic, it may be possible–like dinner with an author. Not gonna lie, that sounds pretty sad that we have to live through our imaginations like that. Dude, if you don’t live your life through your imagination, you’re missing out. And, probably not a very good creative writer. Just sayin’. Anyway, here are some suggestions of things you can include on your literary bucket list and how to carry them out during your lifetime. The sites to which I link in this article–that aren’t my own, mind you–are not owned or represented by me. Nor, do they represent me and my work. 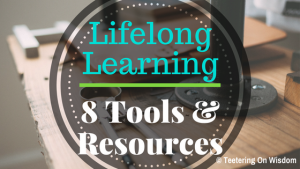 They’re resources that I find useful for the topic–that’s all. Check out my terms and conditions if you aren’t sure what that means. Write a story for each of these prompts. Which standalone should be a series…? 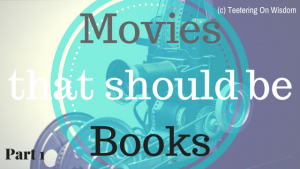 Rewrite your favorite scene, changing the demographics of the characters–how will they react? Some of these are absolutely free, some require money. All of them are possible, though. Most of these are absolutely possible. Some require quite a bit of money. How? I have a job, a family, I would like to have a social life, if I can. Well, with the advent of technology, there are so many ways to hear stories, watch stories, record stories, research stories, etcetera. Watch research documentaries with your kids and talk to them about it. Listen to audiobooks/podcasts for bedtime or during your commutes. Take your family with your as a vacation to those locations. Share your story challenges with others and/or make it a race with others so they stay involved socially. If you really want it to happen, with your natural imagination as a reader/writer, you’ll figure out how to make it happen. But, anyway, the thought is fun. A nerd YOLO, if you will. To me, much more challenging, cheaper, and satisfying than “jump out of a plane”. Plus, most of these are longer-lived and not just a moment that will fade after done (unless you horde selfies). Not to mention, you can get paid for some of them! Just sayin’. 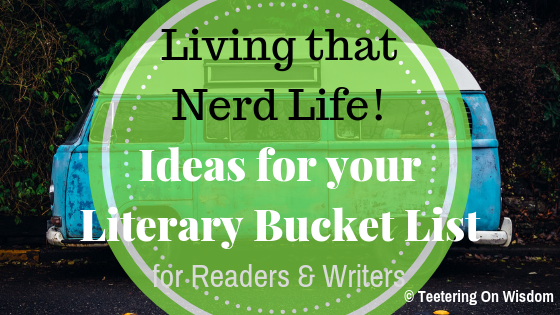 So, what are some things you have on your literary bucket list? Do you think you can pull these off, or have any suggestions on how we can do so? Let us know in the comments below, and on social media, of course. Plus, sign up to receive exclusive info, opportunities, and freebies through the Writer’s Wisdom newsletter that arrives in your inbox bi-weekly–only if you subscribe, of course. Previous story What Exactly Do I Do in a Writing Community?